Okay, be honest…….how many of you are scratching your head trying to recall if you know someone named Brassica??? I’ll give you a hint….cabbage, cauliflower and broccoli. Give up??? The Brassica family is actually a group of vegetables that I am certain you know and love!! I have always called these veggies “cruciferous” but I guess people are getting fancy and using the term brassica which is the genus name. So, whether you call them cruciferous or brassica, these veggies should definitely be a part of your diet. As kids, you probably hated these vegetables. I know I did. They were usually cooked into oblivion so by the time they got to your plate they were totally mushy! Thank goodness we had a dog who would eat anything! I do however have fond memories of some pretty tasty stuffed cabbage rolls that my mom used to make. 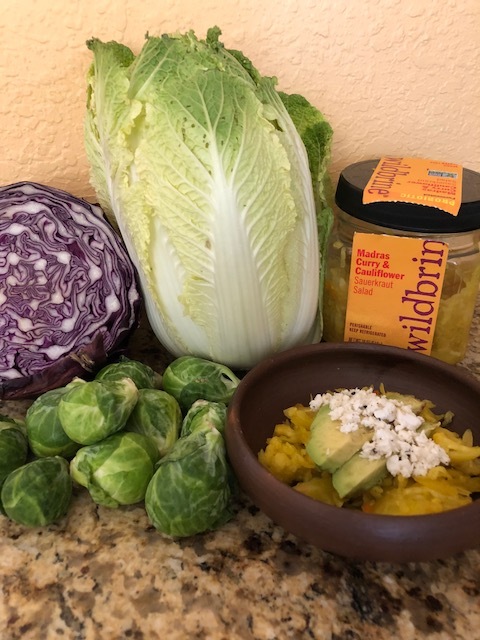 This may be the reason why cabbage and brussels sprouts are two of my favorite veggies! Although these are my favs, the list of cruciferous vegetables goes well beyond cabbage. Arugula, kale, bok choy, collard greens, daikon radish, kohlrabi, turnips, rutabaga, watercress, horseradish and, of course, the usual suspects broccoli and cauliflower to name a few. There are even some cruciferous fruits such as peaches, pears and strawberries. Did you know that the term cruciferous came about because the four equal sized petals in the flower of the plant form a cross or crucifix? And, the term brassica translates to cabbage. Just a couple of fun facts to wow your friends at your next party! Brassica vegetables are a powerhouse when it comes to fighting disease. The nutrient content of these veggies is like no other. They are high in Vitamin A carotenoids, Vitamin C, folic acid and Vitamin K. They also contain glucosinolates which are sulfur containing phytochemicals known to be a major cancer fighter. Like most vegetables they are low in calories, fat and sodium. There is some controversy about eating raw cruciferous vegetables if you have a thyroid condition. The reason for this is these vegetables are considered goitrogens. Goitrogens are substances that can interfere with the production of thyroid hormone. The result could be a goiter which is an enlarged thyroid gland. Keep in mind you would have to eat more than a pound of raw cruciferous vegetables to cause a problem with your thyroid. I don’t know about you but if I ate a pound of raw broccoli, I think I would be a tad more concerned that my stomach would explode versus triggering a goiter. Just saying 😉 That being said if you do have occasion to eat some freshly picked (within 48 hrs) veggies, go for it. The enzymes are more readily available and this enzyme activity helps convert the phytonutrients like glucosinolates into healthy molecules that can be easily absorbed in the upper digestive tract and transported to other areas of the body. When vegetables are cooked, there is not much enzyme activity which means the vegetables are more likely to pass through the upper digestive tract and continue down into the colon. This is not always a bad thing. The extra fiber in the colon could be one reason why cruciferous vegetables are beneficial in preventing colon cancer. A cool trick to increase the enzyme activity of cooked vegetables is to chop the raw veggies and let them sit for a few minutes. This allows the enzymes to activate prior to cooking. I have always done this with garlic, but I had not heard about doing it with cruciferous vegetables. Learn something new every day!! So, there you have it. Do you have a favorite recipe using cruciferous vegetables? I would love to hear about it. Hit reply and let’s chat. 1. Put sauerkraut into a bowl. Top with the avocado. 2. Sprinkle feta cheese on top. Stir to combine if desired. 3. Enjoy alone or as a spread for crackers or a dip for veggies.